This is amazing! How do I buy one and how much does it cost? They're all sold out! Do you have an approximate date on when you'll have more? Do the YPbPr cables support both PAL and NTSC? Do the component cables do any up-conversion or scaling of the video signal? What is the output resolution of the cables? So your component cables don't output "High-Definition" (HD) video? Don't compatibility issues exist between 240p/288p signals and the component video inputs of certain TVs? 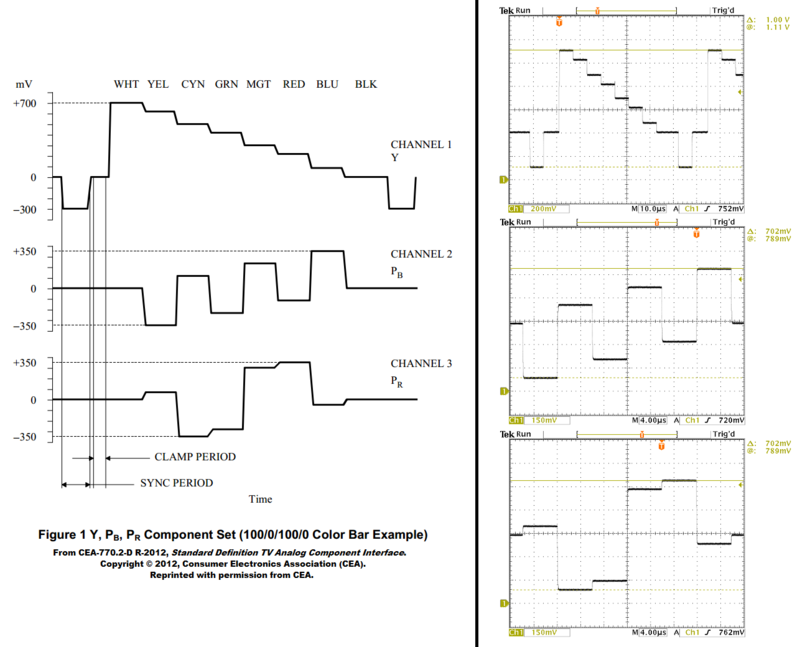 Do your cables use CSYNC to avoid the noise from composite video? So now that I know CSYNC isn't used by the YPbPr cables, do I still need to wire it up when I do this DIY mod? My TV has component video inputs, but it's not an HDTV. Will the cables still work? Why does the video from the component cables look so much better than the standard composite (yellow) cable? How is this any different than using an RGB SCART cable and a SCART to YPbPr adapter? What does "best possible output" mean? Is there a component video standard you are following? Do the Genesis/SNES YPbPr cables add any lag/latency? Is there any difference between HD Retrovision PS2/PS3 YPbPr cables and other high-quality solutions like the OEM Sony and Monster Cables? Which versions of the Sega Genesis / Mega Drive will the Genesis cable work with? What about the Sega Master System II? If the audio is only mono when using the Genesis 1 adapter, why are there two audio cables (white and red)? So how do I get stereo audio out of the Genesis 1 while using your cable + adapter? How does the Genesis 2 Component Cable connect with the Sega 32X? How do I properly connect audio when using a Sega CD, 32X, or both with my Genesis? Why only mono audio from the Genesis 3? Which versions of the Super Nintendo / Super Famicom will the SNES cable work with? Will the SNES cable work with my Nintendo 64? Will the SNES cable work on "X" modded console, since it uses the same A/V connector port? If I use the YPbPr cables on a standard definition CRT, will light guns games still work? I have a SNES/Genesis YPbPr cable with a part# that ends in AG0. Do I need to buy one that ends in AH0? What are the differences between AG0 and AH0? What are the recommended settings for the contrast switches on the Sega Genesis and SNES YPbPr cables? Do you plan on making component cables or adapters for any other consoles? Is it possible to make a solution for NES / is that something you might do in the future? What product do you recommend that does X, Y and Z? This is amazing! How do I buy one and how much will it cost? Please click on the Shop link at the very top of this page to be taken to our online store. There, you can look at prices and purchase our products when they are in stock. To receive the most up to date news on availability, please sign up for our mailing list. You can also find recent news on our Twitter and Facebook pages. Yes. Our cables universally support the video signals from either region. However, it can get more complicated if you want to mix console regions with TV regions (i.e. an NTSC console on a PAL TV). Success while doing this can change on a TV-by-TV basis. No. The cable passes through the original signal timing that the console provides to it. So 240p/288p gets passed through as 240p/288p, and the same thing for 480i/576i (in the rare cases when one of these older consoles uses an interlaced signaling mode). No. High-Definition video is usually considered any video content with vertical line resolutions of 720p, 1080i, or 1080p (regardless of framerate). Our cables do not change the video framerate nor resolution of the console it is connected to. Since consoles like the Super Nintendo and Sega Genesis output Standard-Definition 240p/480i (288p/576i for PAL), our cables also output that same Standard-Definition signal. Indeed, that is true. The input stages in some TVs and display devices were not properly designed and do not accept 240p/288p timing signals over the component video connection. We have future products in development which will address and eliminate this concern. For a more in depth discussion, please see here. The SNES/Genesis YPbPr cables do not use CSYNC. However, through the custom design of our cable and its circuitry inside we are able to extract sync from composite video without introducing noise. The two main reasons for this are (1) we are not driving a full video load, and (2) composite video is only traveling over a short distance before being terminated. Sorry, we do not support any DIY console modifications and cannot offer any assistance with working on and/or installing them. Absolutely. An HDTV is not required to experience the clarity provided by our cables. In fact, many users are thrilled with the quality experienced on their standard definition CRT TVs which have YPbPr inputs. Without getting too technical, the component cables keep the video at the destination (display) as true to the original signal source (console) as possible. For composite video, the added "tricks" to create a single wire video connection need to be undone in the display, hence the original signals cannot be completely recovered. In addition, these composite video "tricks" were implemented very poorly in video game consoles in order to keep their cost down at the time. Component video avoids all this. See this blog post for more details. Several reasons. First, our component cables are more affordable than purchasing those two items separately. Second, our cables are completely plug-and-play and don't require an external power adapter. Lastly, each of our cables is optimized for the console it was designed for. The RGB signals from video game consoles don't reliably follow the SCART RGB standard. These video signals can be too dark, too bright, have smeared lines (field tilt), and contain unwanted noise. Therefore, using a fixed conversion adapter will not always provide optimal quality. By using custom test software, the signals for each console were accurately measured and characterized in order to be properly compensated for within our cables. Think of our cables not only as simple plug-and-play conversion devices, but also as "signal conditioners" to achieve the best possible output from your consoles. Yes. HD Retrovision component video cables satisfy the video level specifications set forth in CEA-770.2-D (similar to EBU N10-1998). The standard is shown to the left, while actual measurements taken from the Sega Genesis YPbPr component cable are shown to the right. Our circuitry does not introduce a meaningful/perceptible amount of latency (less than 1μs ≈ 0.00006 frames). However, it is possible that your television / display device introduces noticeable latency when processing a 240p YPrPr signal. This can be determined ahead of time using the 240p test. The OEM Sony cables have slightly longer lengths. The PS2 variant (SCPH-10100) has an 8ft cord while the PS3 variant has a 10ft cord (SCPH-10490). The HD Retrovision cables are 6ft, but can be extended using our own 6ft extension cables all the way up to 30ft without degradation of performance. The set of PS2 Monster cables we own and tested use a strange grounding scheme, which we've seen exacerbate noise issues in certain scenarios. However, there are different variants of Monster cables and we have no way of knowing if that poor wiring scheme is consistent across all of them. As for performance, the HD Retrovision cables perform objectively better because they use true 75ohm coaxial cable while the OEM Sony cables use generic shielded cables with undefined impedances. But keep in mind that the visual effect resulting from this is dependent on the resolution you're running the console at. To sum it up simply: you won't see a difference in 240p/480i/480p content, likely won't see any difference in 720p/1080i content unless you smack your face right up to the screen, but will probably see a noticeable difference with 1080p content (PS3 only). Almost all of them. The cable was tested with nearly all versions and internal revisions. We have a compatibility list on our Genesis product page which you can refer to for details. No, sorry. The smaller Sega Master System II without the card slot (Model No. 3006) does not have the required connector on the rear of the console. The French version of the Master System II (Model No. 3006-09) can work in certain scenarios. Please see our Genesis page for more infomration. Within our Genesis 1 adapter, the white and red audio outputs are tied together internally to the mono audio output on the Genesis 1 / Master System. This is to support devices that don't have internal detection switches on the right (red) audio jack and also when using certain support equipment such as switch boxes, receivers, and other intermediate devices. The easiest way would be to purchase a 3.5mm audio cable from our store and connect it between the headphone jack on the front of the Genesis and the audio jack on our cable. Make sure you turn up the volume slider all the way up when doing this! It simply plugs into the A/V output port on the back of the 32X. A patch cord is still required from your Genesis to the 32X. If you're connecting a Genesis 2, full stereo output will always be available from the 32X on our cable. However, when connecting a Genesis 1 it depends on the type of patch cable being used. Using the official Sega adapter + patch cable which shipped with the 32X results in no audio from our cable. The same thing happens with many 3rd party patch solutions. But using our own Genesis adapter with any Genesis 2 patch cable results in instant mono audio. Additionally, you may upgrade to stereo using the method described above (this also works with all 32X patch cords). Genesis 1: Connect the white/red audio output from the component cable to your TV or audio device. For mono audio, nothing further needs to be done. For stereo audio, just as you would with a standalone Genesis 1, connect the stereo upgrade cable from the front of the Genesis 1 to the 3.5mm jack on the side of the component cable. Genesis 2: Connect the white/red audio output from the component cable to your TV or audio device. This always grants stereo audio. That's how the console was designed internally. The mono audio is only present on the white audio plug coming off of our cable. Due to possible audio connectivity complications (described above), you might need to connect the white audio plug to a 1-female to 2-male RCA Y-adapter (available in our online store) in order to get audio to play on both channels of your TV or audio system. We have a compatibility list on our SNES product page which you can refer to for details on supported SNES models. The short answer is "no". The long answer is: depending on when your Nintendo 64 was manufactured, it might be possible to internally modify the console to work with our cable. Keep in mind though, that our cable design is based upon measurements taken from various revisions of the SNES. Depending on the type of mod performed, you could get different results. Please see the compatibility list on our SNES product page for more detailed information. Sorry, the SNES YPbPr cable will not work with the NTSC (North America or Japan) Gamecube. These Gamecubes do not output the required signals from the Analog A/V port. Only the PAL (Europe) Gamecubes do. We have not explicitly measured the signal amplitudes from the PAL Gamecube, but have confirmed that the SNES YPbPr Cable works with it, as stated in the list on our SNES product page. Keep in mind that only resolutions of 240p, 288p, 480i, and 576i are supported via the Analog A/V port. 480p would therefore not work with the PAL Gamecube + SNES YPbPr cable combo. Although very unlikely, we have considered duplicating the official Gamecube YPbPr Component Cable. This is the one that goes in the Digital A/V port, which unfortunately only half of the Gamecubes have. Nintendo dropped the port sometime during the Gamecube's life to save on costs. There are current projects out there which intend to address this problem. Therefore, it's unlikely we will need to execute our own design. It's hard to say for sure, since not all console modifications are created equally. The SNES cable was designed by taking measurements from various SNES consoles, so using them with other non-SNES devices is not 100% guaranteed to work. We're hoping that the community will experiment on its own and test our YPbPr cables with as many devices as possible. Yep. We have tested the SNES Super Scope, Genesis Konami Justifier, and PlayStation GunCons on a Toshiba CRT and/or PVM when using our YPbPr cables. These light gun devices worked without any issues. The AH0 is a newer revision which incorporates very minor changes, mostly dealing in compatibility with TVs and other end devices. If the YPbPr cables you have right now are working with your current setup without any issues, then there is no reason to consider the newer revision. Check out the changelogs for SNES (SNS-AH0) and Genesis (GEN0-AH0) for specific details. For the Genesis cable, we recommend the contrast switch be set to the brighter setting on older Sega Master Systems, and with the PlayStation and Saturn adapters. For the Neo Geo adapter, pick which setting works best. For everything else, we recommend the darker setting. For the SNES cable, we recommend the darker setting with later revisions of the SNES. For older revisions of the SNES, an (HD Retrovision approved) modded N64, and an (HD Retrovision approved) modded SNES mini, we recommend the brighter setting. The likely remaining candidates are Sega Dreamcast, Nintendo Wii, and Microsoft Xbox. We don't have any plans to tackle the NES, since the required signals are not native to the console. There is an upgrade available by Tim Worthington which can overcome this. This does require the console to be modified. Although not officially supported and guaranteed to work with the SNES YPbPr cable, people have had success with using the two together. We have begun listing such items here.